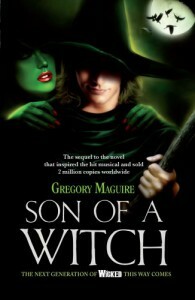 After finishing the book and peeking at other reviews here on GoodReads I was suprised to see that so many people hate both the Wicked novel and Son of a Witch with such passion! I found both highly enjoyable reading. The writing might be a little disjointed, but I never liked streamlined one-thought novels anyway. I like the smorgasbord approach. They do leave a hell of a lot of questions hanging, both novels, but that just makes me want to read the next one. I wonder. Is it the violence? That they mention genitalia and gay people? The helplessness of individuals in the face of government, the lack of untarnished heroes? All of which only makes me like a novel more. It's amazing how a thing like entertainment value can be so differently... valued. Shouldn't there be some objective measure of it? A tiny teeny touch of objective measure based on our shared experiences? C'mon. You had to at least appreciate the bits with the maunts. Oh well... Some people like Martin Amis.